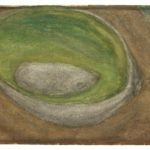 This exhibition continues a series of retrospective exhibitions initiated by the RHA to present and document the finest senior artists working in Ireland today. In the past decade, under this programme, we have presented work by Barrie Cooke, Martin Gale, Edward Delaney, Stephen McKenna, Robert Ballagh and Carey Clarke. We now have the honour of featuring the sublime work of Maria Simonds-Gooding. Simonds-Gooding’s work is in the best Modernist sense, reductivist. She deliberately absences the unnecessary and foregrounds only line and space to create essential worlds that are recognisable but not locatable. And yet it is all about locale, though those locations can be in the Sinai Desert, New Mexico or Kerry – all expose the ancient negotiation between man and land and subsistence. If the cave drawings of Lascaux are about the hunter homo sapiens then Simonds-Gooding’s works are about subsistence farmers and the effect their toil has upon the land. Simonds-Gooding’s fields, bound by walls or ditches, do not to signify proprietorial ownership but a place won back from the wild and untamed land that surrounds it. They are statements of defiance and endurance, places where a struggle against the elementals to eek a survivalist living has left its evidence. It is also about transcendence, her images touching something deep inside our collective unconsciousness. Her schema, elegant and beautiful, suggest an algebra of traces, specifically, mankind’s agrarian efforts in places remote and severe. Patrick T. Murphy, RHA Director. Born in India in 1939, Maria Simonds-Gooding studied at the National College of Art, Dublin, Le Centre de Peinture, Bruxelles, Bath Academy of Art, Corsham, UK from 1962 – 1968 and has lived and worked in Kerry since 1947. She was elected a member of Aosdána in 1981 and was elected full membership of the RHA in 2012. Solo exhibitions include Ceiliúradh Mháire Mhaith/The Art of Maria Simonds-Gooding, Great Blasket Centre, Kerry in 2011, Fields of Vision, Taylor Galleries, Dublin in 2004, The Graphic Studio Gallery, Dublin, The Vangard Gallery, Cork, The Lemonstreet Gallery, Dublin in 2000 and Taylor Galleries, Dublin in 1998, 1987, 1985 and 1980, Galarie Timao, The Haque in 1988, Crawford Municipal Gallery, Cork, Works from 1965 – 1985 in 1985. Hoshour Gallery, New Mexico in 1983 and Betty Parsons Gallery, New York in 1982 and 1978. Simonds-Gooding exhibits regularly at the RHA Annual Exhibition and has had work included in the following selected group exhibitions; Time Out of Mind: Works from the IMMA Collection, 2012, The Moderns, Irish Museum of Modern Art, 2011, Graphic Studio, 50 Years in Dublin, Irish Museum of Modern Art, 2010, Three. Callum Innes, Maria Simonds-Gooding, Charles Brady, Irish Museum of Modern Art, Dublin in 2007 – 2008, The West as Metaphor, The Royal Hibernian Academy, Dublin, 2005, Trasnú, Collaborative Exhibition with Cathal O’Seacaigh, An Gaileraí, Dhún nan Gall, 2003, The London Original Print Fair at the Royal Academy of Arts, London, 2000, 1995, Norwegian International Print Triennale, Fredriktad, 1993, 1991, 1989. Damon Brandt Gallery, New York, 1989, 1986. Betty Parsons Gallery, New York, 1982, 1980, 1979, 1978. Irish Exhibition of Living Art, Dublin, 1979, 1970. Selected commissions include the Four Seasons Hotel, Dublin, 2002 and the stamp advisory board, 18p and 19p denomination stamps on Irish folklore in 1981. Her work is held in many private and public collections including An Chomhairle Ealaion, The Arts Council, Dublin, The Albuquerque Museum, New Mexico, The Central Bank, Dublin, Commission of European Communities, Brussels, Crawford Municipal Art Gallery, Cork, The Hirshhorn Museum, Washington DC, Irish Museum of Modern Art, Dublin, The National Gallery of Modern Art, New Delhi, The Metropolitan Museum of Art, New York and the Saatchi Collection, London. A full colour catalogue accompanies this exhibition, which includes and essay by John Yau, Humanity’s Fragile Alliance with the Landscape and Colm Tóibín in conversation with Maria Simonds-Gooding, courtesy of the Irish Museum of Modern Art.